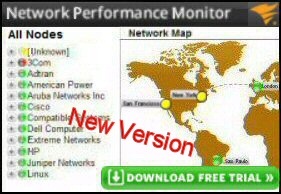 Performance Monitor (perfmon) is a powerful program found in all Microsoft servers from NT to Windows Server 2008. I think of Performance Monitor as more of a toolbox than a single gadget. I will let you into a secret, few people REALLY know Performance Monitor, so make a name for yourself and master this box of tricks. The initial learning steps are steep. To begin with, you can be overwhelmed by the variety options. I have created a whole section dedicated to performance monitoring (left menu). Half the pages are aimed for the beginner, with the emphasis on learning how to use Performance Monitor; while the other half is designed to show you how to use the counters to detect bottlenecks. Planning the capacity of your servers and subnets. Setting alerts so that you can nip trouble in the bud. Creating baselines when activity is low. Understanding the effect of your workload on resources. SolarWinds Orion family of network performance tools. There are three parts to learning your performance monitor craft, the art, the science and the knack. At a more practical level, be clear on the question that you want to ask, and then research the best counters to answer your question. The first skill is in choosing the right objects and the best counters to monitor. To make sure you do not miss a vital clue be methodical and always check the ‘big four’ resource objects, memory, processor, disk and network. I will give tips on how to choose your own counters for your particular circumstances. The scientific techniques are relatively easy to teach. My goal will be to show you the shortest way to create logs and the easiest way of loading the logs into System Monitor. You will also discover that performance monitor has numerous features to make collecting data easier and more profitable.